Horologium Oscillatorium was named in honor of Christiaan Huygens (1629-1695) by Nicolas-Louis de Lacaille. Amateur astronomers remember Huygens as the inventor of those horrible little eyepieces supplied with every 600x, 60mm department store trash scope. In fact, these eyepieces perform well at longer f ratios, and are genuinely achromatic. Huygens also claimed credit for describing light as a wave, and recognized that the twin lumps Galileo saw protruding from Saturn was actually a ring. Oh yes, he also invented the pendulum clock, from which this constellation derives its name. Educated at Leiden and Breda (he studied law and mathematics), he spent his most productive years in the Hague, before moving to Paris (1666). A couple of final comments: The pendulum clock allowed much more accurate time keeping. A pendulum one meter long has a beat (one half swing) of almost exactly one second. Also, Huygens wrote one of the earliest discussions of extraterrestrial life called Cosmotheoros. 57k JPEG NGC1512 is a spiral galaxy located in northeastern Horologium, 2.1° WSW of Alpha Horologii. Dreyer describes it as having an extremely faint ring. The remainder is bright (mag. 11), quite large (8.9'x5.6'), round, with a brighter middle. The ring Dreyer describes is an active star forming region, and is visible only in larger amateur instruments. 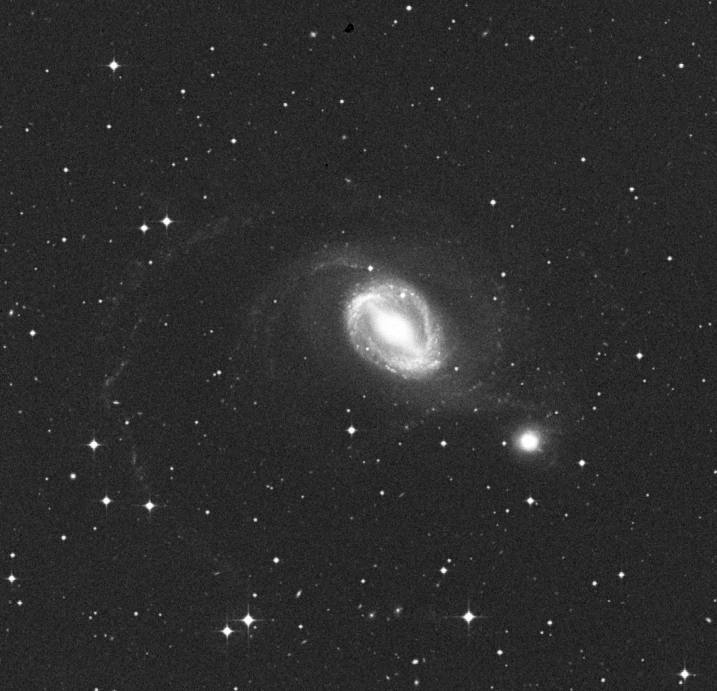 NGC1510 sits 5' to the south-west. Dreyer describes this small (1.3'x0.7'), faint (mag. 13.5) companion to NGC1512 as showing very gradually much brightening toward the middle. Image from the Digital Sky Survey. 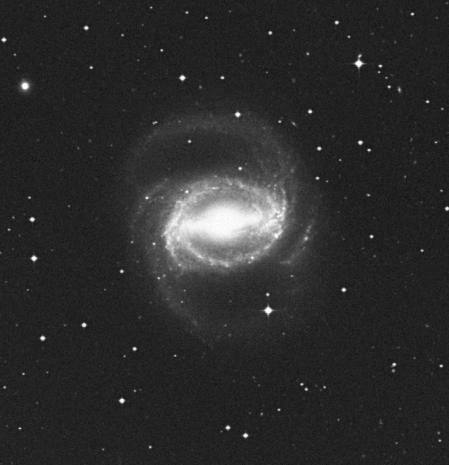 19k JPEG NGC1433 is a barred spiral galaxy located in east-central Horologium. It forms the right angle of a triangle consisting of itself, Alpha Horologii, and Alpha Doradus. Dreyer describes it as very bright (mag. 10.8), large (6.4'x5.8'), moderately extended to the west, with a very abruptly very much brighter middle. Indeed, the center looks like a 10th magnitude star. The star forming ring, so prominent in photographs, is not visible in amateur telescopes. Image from the Digital Sky Survey, and given additional processing. 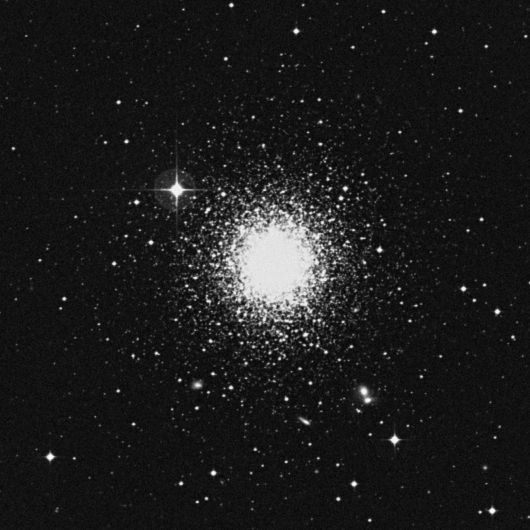 47k JPEG NGC1261 (Bennett 11, Caldwell 87) is a globular cluster located in west-central Horologium, 4.5° east of the mag. 5.2 Zeta Horologii. Dreyer describes it as bright (mag. 8.4), large (6.9'), round, and very resolvable (in a 12" telescope).